Working with encaustic wax is a challenge at the best of times. 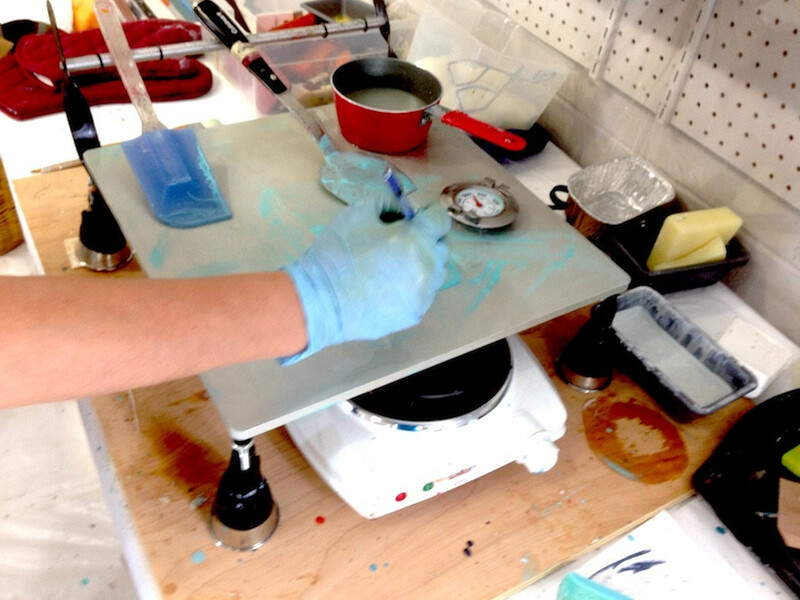 It's easier to work small because the melted wax hardens within seconds between the hot plate and painting. You need to work fast or the wax on your brush won't spread. 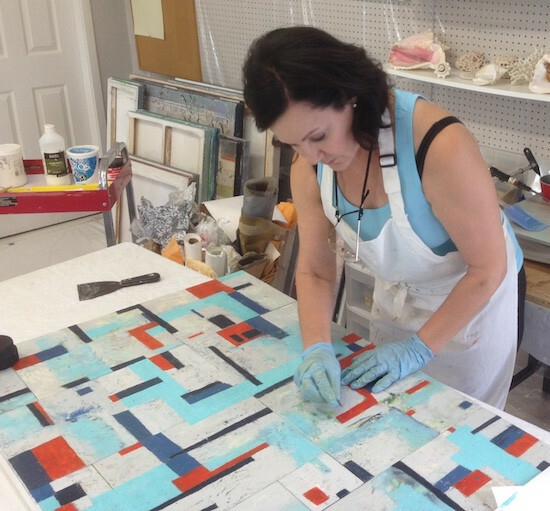 To create a large painting with encaustic wax requires almost super-human speed. 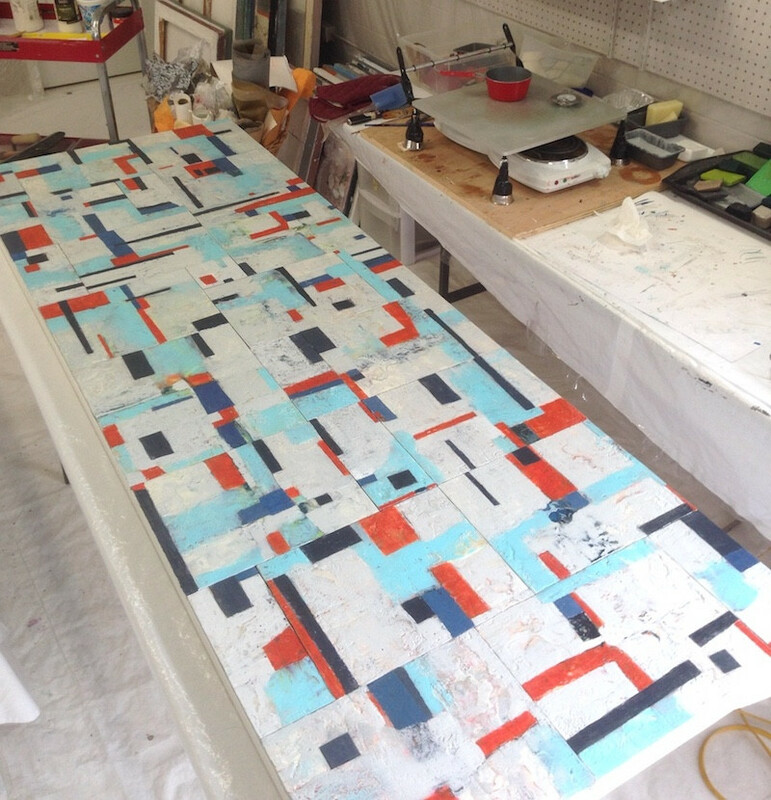 This particular painting measures 28 x 80 inches, which is considered enormous for encaustic. I'm still working on it but I thought I'd let you in on the process. I had about 22 unfinished encaustic panels sitting on a shelf in my studio. Lately, I especially enjoy working large so tackling all these small pieces didn't turn me on much. Since these panels already were covered with several layers of wax, I decided to make good use of them by creating a large modular painting with them. Encaustic art must be on a solid support to keep it from cracking. I bought a primed hollow core door slab measuring 28 x 80 inches, Each of my encaustic panels was precisely cut and attached neatly to the door slab with special archival framer glue. You can still see the seams in the photo above. Above is a closer look at my encaustic set up. As you can see I have two small hotplates under an anodized aluminum work plate. Notice the thermometer. Encaustic wax should never get hotter than about 180 - 220 degrees Fahrenheit or it begins to smoke dangerously. The little red saucepan holds clear melted beeswax medium which I use to dilute the wax pigment bars. One tool I use to give me a little more spreading time between the hotplate and the art is the metal scraper you see sitting on the plate. I hold the hot scraper under my brush as I work to keep the wax warm a tiny bit longer. Many many layers of color were added. I also filled in the seams between panels to make it look like one giant piece. Each fresh layer of wax color must be fused with a heat gun to make sure it adheres to the layer beneath it. And I like to use a razor blade to scrape away any drips and high ridges as you see below. After the painting is finished, I always seal it with a Cold Wax paste and buff the surface to a hard shine until it glows. I just finished it yesterday, and "ta da" - here it is. 'Momentum' encaustic on wood, 28 x 80 inches, © 2017 Shirley Williams - Available $3,900. 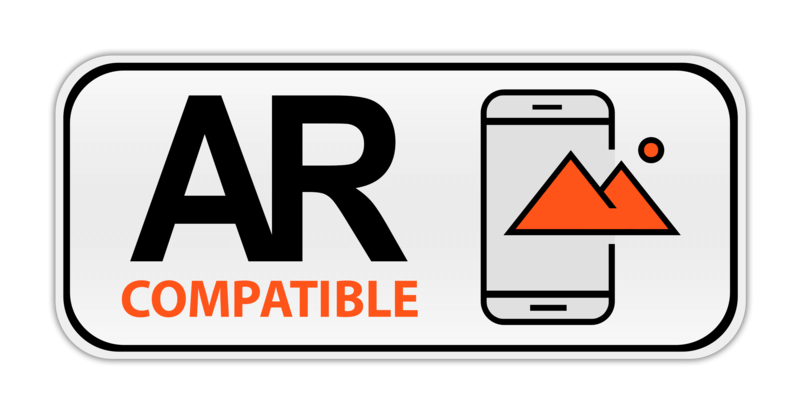 If you want to be one of the first to see it, be sure to get on my VIP Email list.